The Alrefae family is from a town in Syria called Umm Walad that is about 80 miles south from Damascus. 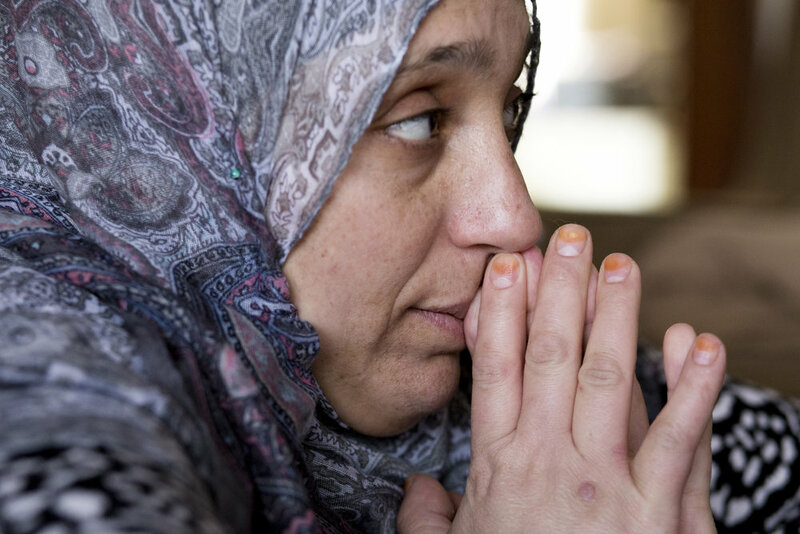 Because of the worsening conditions, they fled from Syria leaving everything behind except a few suitcases with clothes, and found refuge in Jordan for a few years before coming to America in July of 2016. Today, they live in the west side of Cleveland. Mariam, the mother of three children is working toward getting her license and finding her footing in her new surroundings while dealing with all the responsibilities of being a mother. Mariam visits the Islamic Center of Cleveland for the first time since she arrived in the States on Monday, Dec. 5, 2016. As she stepped into the prayer room, she stopped at a white pillar and looked up into the light for a moment. "I'm really happy to see a mosque like this because in these four to five months, I haven’t seen a mosque this beautiful," Mariam said. Rajat Manan, a volunteer for Salaam Cleveland, plays with Baisan, 5, during his regular visits to the Alrefae families home on Saturday Nov. 12, 2016. Salaam Cleveland is a community organization who helped the family once they relocated in Cleveland. Mohamad indulges his preoccupation with cramming into small spaces. Mariam prepares herself to take her drivers permit exam at the Bureau of Motor Vehicles on Wednesday, Dec. 7, 2016. Since the move to America, Mariam has began to adjust to her new life by working toward getting her license and finding her footing in her new surroundings while dealing with all the responsibilities of being a mother. She hopes to soon be able to drive herself and her children to places like the Salaam Cleveland office where they have began taking English classes every Saturday. Mariam's study guide for her drivers exam. Baisan, 5, is quizzed on her English, which will determine whether or not she will advance to the next level. Baisan's teachers say she is always excited and eager to learn new words every Saturday. Adan, 6, relaxes on his families balcony. Mariam adjusts her hijab for a portrait in her backyard. Two year-old Mohamad sleeps in the car as his mother Mariam and Runah, a volunteer for Salaam Cleveland, leave the Bureau of Motor Vehicles after Mariam received news that she failed her drivers permit exam on Wednesday, Dec. 7, 2016. Mariam waits nervously to break the news to her husband about failing the drivers permit exam as her and Runah discuss options of retesting. Mohamad spends most of his day waiting for his siblings to return from school and watching American cartoons translated into Arabic. Above the cabinet reads "Bismillah alrahman alraheem," an Arabic phrase meaning, "In the name of God, the Most Gracious, the Most Merciful." Like many in America, preparing coffee is an essential ritual for the day. The family enjoys a homecooked meal after the end of a long day. News on the conflict in Syria is broadcast on the television while Mohamad sleeps in his home. 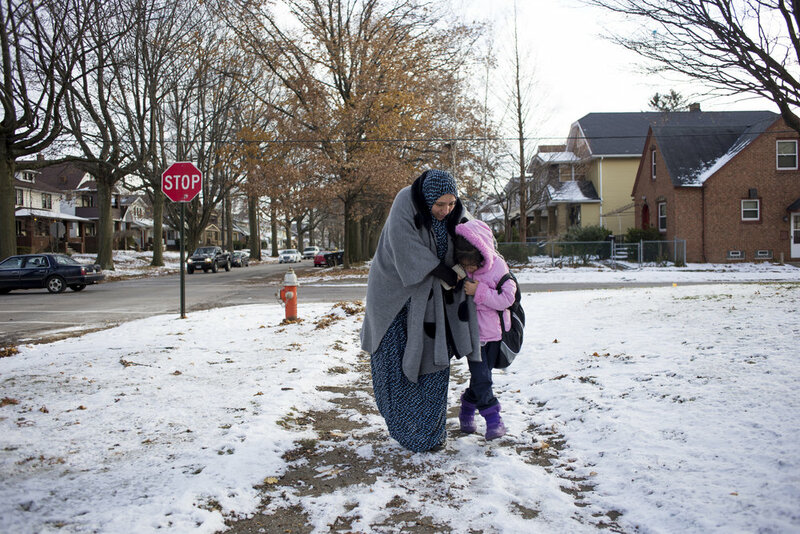 Mariam helps her daughter Baisan navigate the precarious and icy sidewalks as they walk home from the school bus.